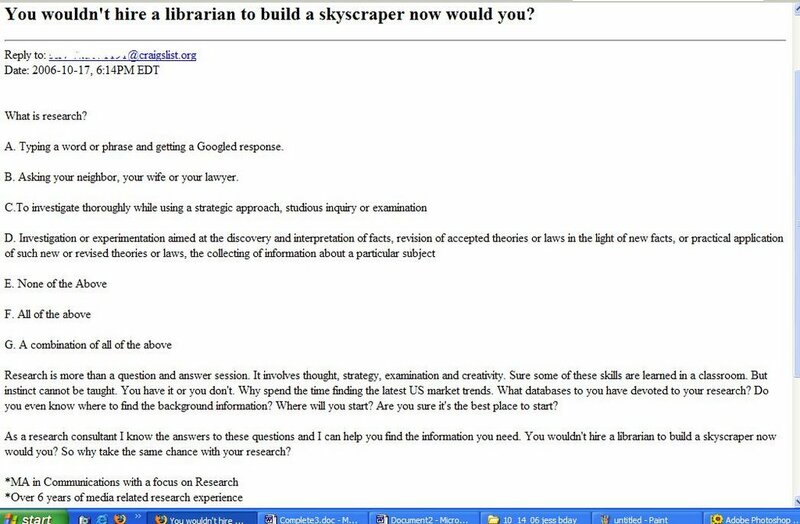 As seen on Craig's List ... You wouldn't hire a librarian to build a skyscraper now would you? 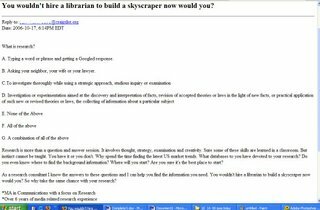 The better question: Why would you hire a librarian? Isn't that the question that needs a good answer - other than the job description requires it? As a librarian, I'm already hired! Just ask - at the info desk, by phone, by email, and yes, even in the supermarket. I'm not trying to sell you anything. I'll recommend reliable resources with a variety of perspectives on your topic to meet your needs and take into consideration the best format to provide the info in, including databases, at no charge. I'll help you as much as possible, but won't be striving for billable hour amounts that will cover my car payment or house payment, or office rent. If you decide your research needs are beyond what you and I can accomplish together, then I'll refer you to others with more expertise, or even assist you with finding a researcher to hire. Many research needs can be met at low or no cost at your local library.